Electrothermal's Electric Bunsen combines the advantages of a regular gas burner with the clean, easy operation of our Electromantles. Radiation from the heater is directed upwards to a focal point. 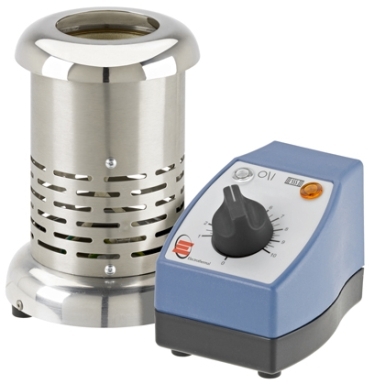 The Electric Bunsen is ideal for heating test tubes, crucibles, small flasks and beakers, regardless of their shape. Electrothermal's Electric Bunsen, combines the advantages of a regular gas burner with the clean, easy operation of our Electromantles. It is corrosion-resistant and has a cool-to-thetouch base. Radiation from the heater is directed upwards to a focal point. The Electric Bunsen is ideal for heating test tubes, crucibles, small flasks and beakers, regardless of their shape. The MC5 Controller has been designed to provide a comprehensive answer to control the heating of resistive loads such as Electric Bunsens, Electromantles, Heating Tapes and Cords for bench top operation delivering up to a maximum of 800 Watts. A rod support clamp is provided at the rear of the controller to take a standard 12.5mm diameter rod. An accessory extension mains lead is available where remote operation is required e.g. in a fume extraction unit.